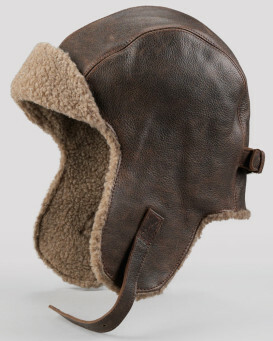 Classic aviator hats were designed for warmth and protection from the elements while flying in all kinds of weather. They're the stuff of our proud history, worn by our early air explorers, aviation pioneers, and fighter pilots. This modern line of hats all really look like they belong in an old black and white film with derring-do and rakish pilots haring off into the wild blue yonder to do their duty for Queen and country. You can have that classic aviation pioneer or movie war hero look too if you grab one of our leather and sheepskin pilot hats. We offer two distinct tiers of hat. 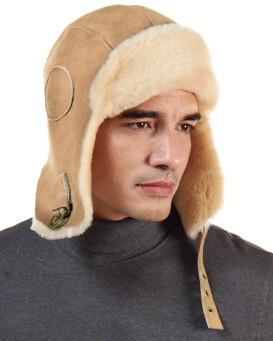 The first is the shorn sherpa lined leather hats. These are very comfortable and warm. They look good, and they're not really all that costly. 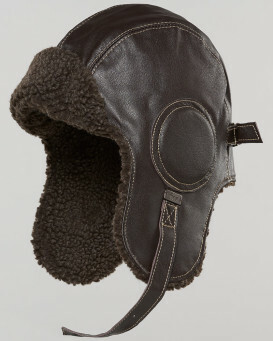 The second tier is comprised of the beautiful shearling sheepskin hats which are even warmer, and softer. They're more expensive then the sherpa hats, but they certainly won't break the bank. Regardless of which level of these hats you purchase you're going to get an authentic leather shell that looks simply amazing. 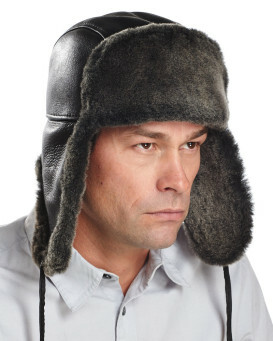 With the ability to strap the ear flaps down across your chin you can engage in all the outdoor mayhem you want to without worrying about losing your warm headgear. This makes the hats perfect for active work and play. No matter if your day is all about splitting wood or if you're going to be tearing through the woods on your snowmobile, these hats will keep you protected from the chill. Each of these hats comes in a different color leather, so if you're looking for something to match another piece of your ensemble there's a good chance you'll be in luck. But regardless of your choice of color you can certainly be proud to be wearing a hat with a design inspired by such a storied history. 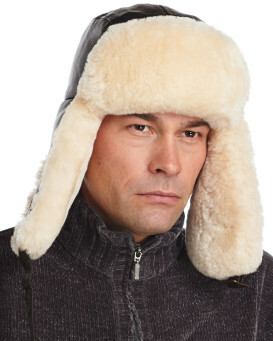 "I wore this hat on the coldest day of the year here in 4 yrs. 7 degrees today. With wind chills at -20 degrees. This hat is warm kept my neck ears and head nice and warm. Inglad i made the purchase. I needed alil more than a scully and this hat does the trick. I wear a 7 5/8 hat and this hat seamed a tad bid small i think its because the fur inside the hat but not enough for me to return it. I think i need to break it in alil. If you have alot of hair i would go a size up. Shopping on the site was easy as 1 2 3 a delivery as promised. I will be shopping here again." "exactly what i have come to expect from furhat world. gorgeous quality product that will last and please for years to come." "My husband loves this hat. It keeps his head warm and dry in the worst of conditions. He lost it on the train last year and we just repurchased the same hat. After 5 years of daily winter use, it still looked brand new. I highly recommend it." Based on 531 customer reviews.